Primary protection (Main protection) is the essential protection provided for protecting an equivalent/machine or a part of the power system. As a precautionary measure, an addition protection is generally provided and is called Backup Protection. 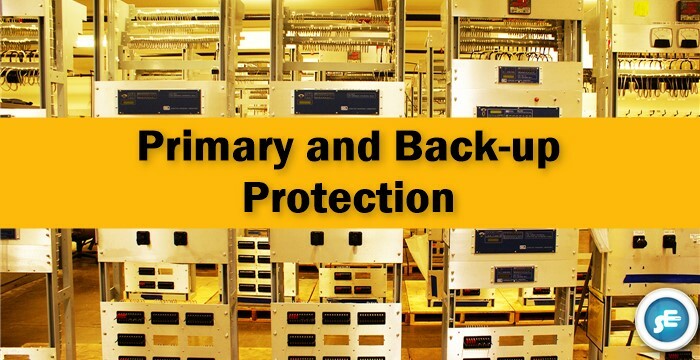 In this post we will look in to the difference between primary & backup protection, advantages of backup protection, and methods of backup protection. If any fault occurs in the protected area, the primary protection act first. If primary protection fails to act, the back-up protection comes into action and removes the faulty part from the healthy system. If due to some reason, the Main protection fails, the Back-up protection serves the purpose of protection. Main protection can fail due to failure of one of the components in the protective system such as relay, auxiliary relay Current Transformer, PT, trip circuit, circuit-breaker, etc. If the primary protection fails, there must be an additional protection, otherwise the fault may remain uncleared, resulting in a disaster. When main protection is made inoperative for the purpose of maintenance, testing, etc. the Back-up protection acts like main protection. The cost of back-up protection is justified on the basis of probability of failure of individual component in protection system, cost of the protected equipment, importance of protected equipment, location of protected equipment, etc. Same breaker is used by both main and back-up protection, but the protective systems are different. Separate trip coils may be provided for the same breaker. The main and back-up protections provided at different stations and are completely independent. The system having central control can be provided with centrally controlled back-up. Central control continuously supervises the load flow and frequency in the system. The information about load ﬂow and frequency is assessed continuously. If one of the components in any part of the-system fails, (e.g. a fault on a transformer, in some station) the load flow in the system is affected. The central coordinating station receives information about the abnormal condition through high frequency carrier signals. The current is measured at various points along the current path, e.g., at source, intermediate locations, consumer end..The tripping time at these locations are graded in such a way that the circuit-breaker/fuse nearest the faulty part operate first, giving primary protection. The’circuit breaker/fuse at the previous station operates only as back-up. Referring to figure, the tripping time at station C, B and A are graded such that for a fault beyond C breaker at C operates as a primary protection. Meanwhile, the relays at A and B also may start operating but they are provided with enough time lag so that the circuit-breaker at B operates only if the circuit-breaker at C does not.